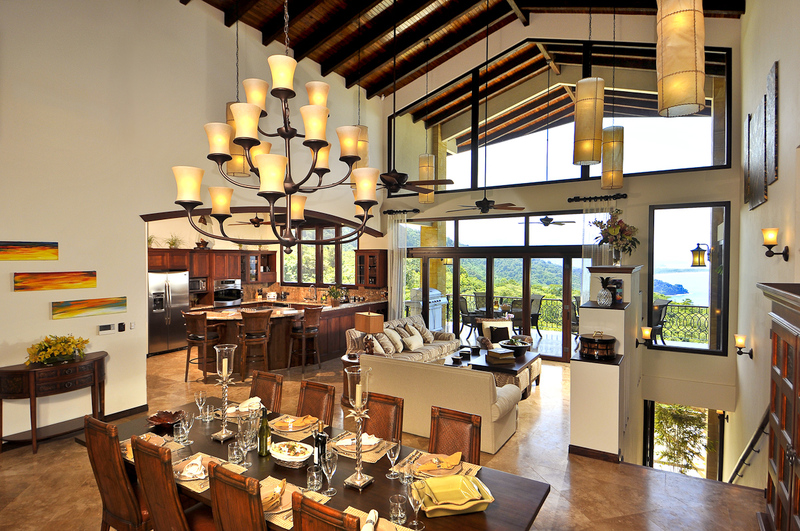 If you enjoy mezmerizing natural beauty, water-related activities nd regular visits from toucans, howler monkeys, butterflies and sloths – Casa Big Sur is for you. 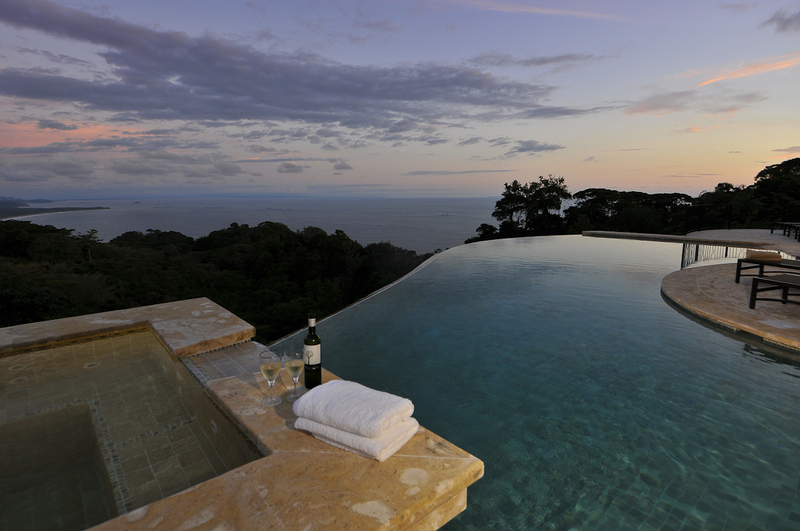 Casa Big Sur is a one-of-a-kind masterpiece nestled in the lush tropical rainforest, located in Dominical and the Southern Zone of Costa Rica where the lush verdant mountains meet the Pacific Ocean. The mesmerizing views include 60 miles of coastline and taper down to converge with the ocean. This stunning 6,500 square foot home, currently available for fractional purchase, offers an extraordinary indoor/outdoor living experience including all the amenities you are accustomed to from a 5-Star Resort. With a fully equipped gourmet kitchen, outdoor living room with wet bar, infinity-edge pool and hot tub, you can enjoy spectacular ocean and mountain views! The main floor boasts two private master bedrooms, each with a luxurious bathroom including whirlpool tub, walk-in closet, and spacious private covered balcony. A third guest bedroom has a desk and a cozy balcony which can be enjoyed privately or joined to the main patio. On the lower level, a fourth guest bedroom opens to the pool deck and has an amazing outdoor shower. A fifth guest bedroom is adjacent to the large game room and gym with access to the patio and pool and can be utilized as a movie room. Nearby you'll find multiple restaurants and stores and all the important amenities which will make your stay convenient. While there's no real shortcut to finding cheap airfare, if you're willing to put in a little time and effort, you could save big on your next flight. 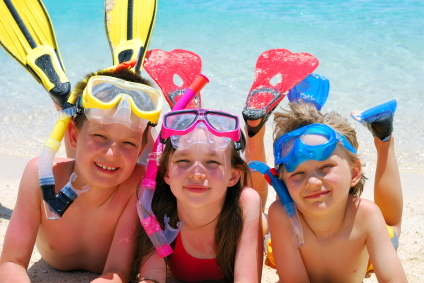 Here are nine tips to help you save money on your next vacation. Set up daily or weekly price alerts will help you know when prices drop so you can get the best deal. If you're flying within the U.S. or to select international destinations, Bing Travel (Bing.com/travel) can help, offering fare predictions for most major cities. Just plug in your itinerary and the site will advise you either to book now or to wait, depending on whether the fare is expected to rise or drop. Another useful site is Kayak.com, which offers fare history graphs for domestic and international flights. Prices are at their lowest between 18 to 28 days prior to your trip and is the optimum time to book. Domestic fares are lowest 21 days before departure. The average fare increases 5% two weeks before departure, with fares increasing 30% from their lows the week before departure. International fares don't fluctuate as much. 34 days before departure, fares are about 4% lower than the average at six months before departure. By booking a package deal (hotel and airfare) with an OTA, people can save an average of $525 on their vacation, with an average of $1,000 saved for weeklong vacations to popular destinations. Airlines announce their sales on Tuesdays. Mid-day Tuesday to late-day Tuesday or early Wednesday is a good 24-hour sweet spot where you can find the latest sales. Wednesday is the best day to depart, followed by Tuesday and Saturday. Experts cite savings of up to 10% when traveling midweek to midweek. For weekend trips, you'll find that airfare is cheapest when you depart on Saturday and return on Monday. Overnight flights can be good bargains, as well as late afternoon or dinner flights. Initially, when you're doing your search, don't specify departure times. This way, you'll be able to see the time of day that really is the cheapest to fly. A one-stop flight in a city that's a hub for the airline can generate some dramatic savings and lower fares. When traveling with small children, time during a layover may be a welcome break from the plane. Puerto Aventuras is a private "guard gated" community, located approximately 55 minutes south of the Cancun airport (CUN) in the Mayan Riviera. There you will find stunning natural beauty along with two large marinas, a 9-hole golf course, tennis, biking, fishing, scuba diving, snorkeling, kayaking, parasailing and catamaran adventures. You won’t run out of things to do – all available for your use right outside your door. The Mayan Riviera was named as one of Frommer's Top Destinations for 2012. You have your choice of dining options with restaurants that offer outdoor dining adjacent to the marina area where you may swim with trained dolphins. Intermixed with these restaurants are little shops that are located around a waterway with dolphins, stingrays and manatees. Or you can walk a short distance to the docks and buy some fresh fish to take home and grill. Amenities within Aventuras Club include large free flowing swimming pools with waterfalls, 10-person outdoor whirlpool tubs, elevators, covered barbecue areas, laundry facilities, a fitness center, clubhouse, beach with private palapas, kayaks, bicycles and free golf cart transportation within the resort community.